So pretty! I love those delicate butterflies, and that little gingham bow tops it off perfectly! Gorgeous card. I've plucked up the courage to use proper thread recently as I think it showed up much better than ink. I don't have a sewing machine so I paper pierced the holes and sewed by hand. I was very pleased with the result, it might be worth having a go, much less nerve wracking than using a sewing machine! 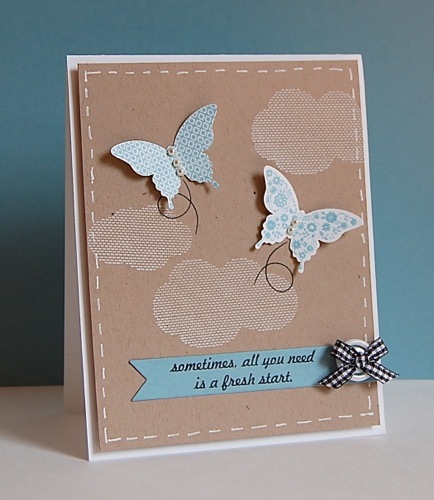 I love those patterned butterflies and the soft white clouds on kraft. The black gingham bow is a great finishing touch! As for sewing, I use a basic Singer machine but would love to spring for a better model that will take heavy duty thread. I do love the look of stitching on a card and definitely use my machine more for paper than for fabric these days! Wow, this is soooo pretty! Love the sweet and peaceful look to it. You cased Joy well! Love those clouds on kraft. so fine.. so elegant.. love this Maureen. Love those clouds against the kraft! Maureen, your card is delicious! I'm a sucker for white on kraft, and the pop of aqua is so lovely! Congrats on the Top Three recognition! Well deserved! The white clouds on Kraft and the little black bow accent really made the whole card very eye-catching. I'm with you on the sewing-I actually have a machine, took it out of it's hiding place and found that my stitching needs a lot of practice. I prefer a white pen and the faux technique! Absolutely beautiful! Love your CASE and a big congrats on your well deserved top 3!